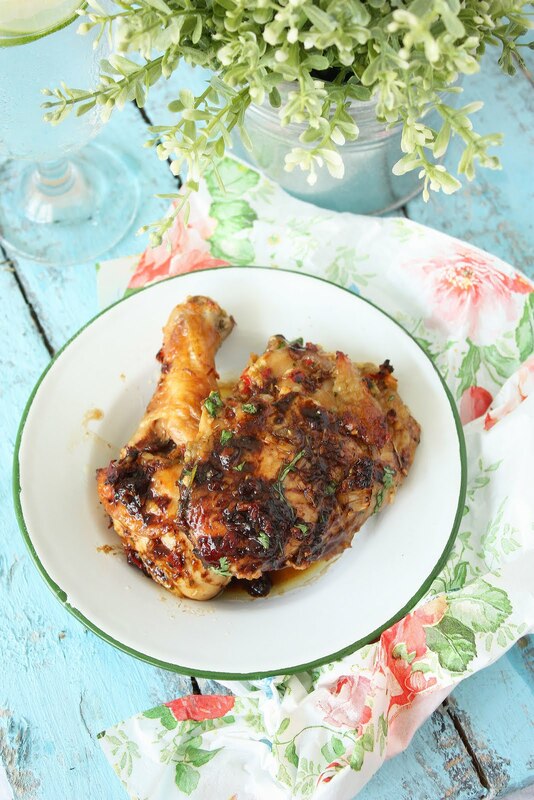 This is another grilled chicken recipe from Rachel Allen. Thai influenced and easy. I was tempted to add some coconut cream but decided otherwise at the last minute because I thought her chicken looked yummy enough. We had this for dinner. I was expecting it to be a little stickier considering the name but it wasn't as sticky. Okay I'll admit I did not follow the recipe to a T.......neither did Rachel on tv.....but it was tasty. 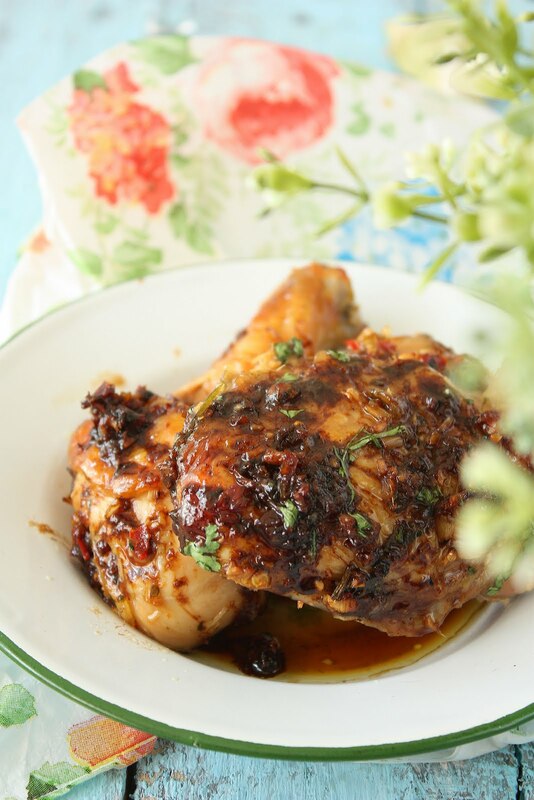 The next time I make this i would add some dry roasted and crushed cumin seeds or a dash of cumin powder and a splash of coconut cream to the marinade. I think it would be much more flavourful. Having said that, this wasn't bad at all. I like baking or roasting chicken. I get to nap. Put all ingredients except chicken into a small food processor and process until a loose wet paste. Dry chicken pieces well, slash each piece twice at intervals to allow the marinade to penetrate the meat. Place chicken into a large plastic bag. Pour the marinade/paste into the bag and massage chicken pieces gently so that the marinade covers the chicken and coats evenly. Reserve teh excess marinade for later. Refrigerate for a few hours or overnight. 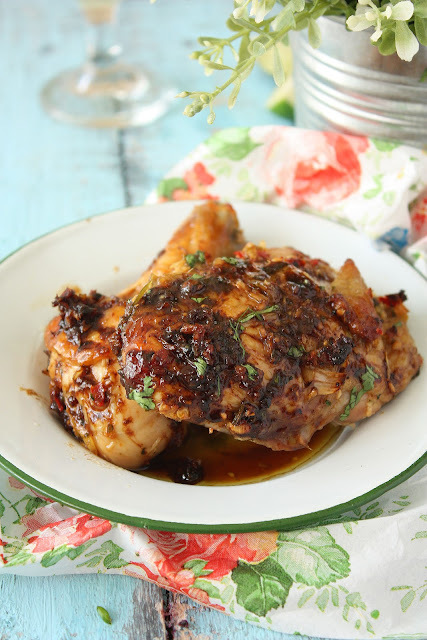 Take chicken pieces out of the marinade and place on a baking or roasting tray. Roast for about 40-45 minutes at 350 F. Take the roasted chicken out and check for doneness by looking at the juice that runs out. If it is clear and has no pnkish hue it's done. Using a tong lift off the chicken pieces onto a large platter. Take the excess marinade and pour into the baking tray. Place the baking tray over the stove on medium heat. Stir and adjust seasoning if necessary and reduce the sauce until it becomes a thick syrupy liquid. Pour it over the chicken pieces. Serve with hot steaming white rice. Yum. I've made a very similar dish before so I can totally imagine the tasty flavours here! Zurin..you have the photography down pat. I love that your food looks real..but the back is always dreamy..the colors etc..Love the florals here..
Tq :) There is no special lens. I use my standard lens....my one and only :)) I just adjust teh focal points to the full 9 points whenever Im shooting from up above. I also use a tripod that is more than six feet high. Oh and a step ladder to climb up to my camera....:P I wish I had more space. Its always a struggle to do a shoot here. Its all in my tiny tiny tiny kitchen.... so there is a lot of moving things aside and putting them back after. Gorgeous looking chicken.. 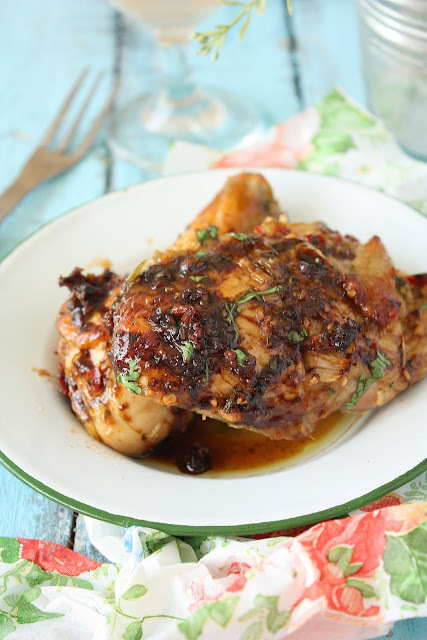 I haven't made a sticky chicken in ages... opting for a straight roast... this looks wonderful! Zurin..then you are even more of an artist than I thought.. Your kitchen is tiny? One would never ever guess..Where do you put all your pretties? Wish I could come to your house and eat this right now! Zurin,whether you follow to the T or not ,it looks good ;) this came at the right timing,I have no more idea what to do with the chicken in the freezer ;) shall try this;) thanks. Oooh yummy! I like the look of this dish, especially the thick sticky sauce. I am sure it tasted great with rice. I'm a Singaporean based in Pakistan. I've been missing Malay food (and regretting that I've never learnt to cook it!) what with `Eid drawing near. I'm so pleased that I found your blog - you've inspired me to try cooking my favourite Malay dishes myself. the sticky thai chicken looooooooks very delicious!!!! selamat hari raya to you n family!